Picking the right hosting solution is one of the first and most important decisions you will make for your website. While there are a lot of available choices, none can coordinate the flexibility and level of control you will get with a dedicated server. When you use a dedicated hosting service, you will be given a server that is exclusive to you. This guarantees no other client will share your resources or have access to your information. In an easy term, dedicated server hosting provides exclusive access to a physical server. That server is only available to you and your website. This is just opposite to VPS hosting and shared hosting, where your website possesses the same server as numerous other users. With your own dedicated server, you have more flexibility to configure it however you want, and you do not need to share its resources with other websites. Dedicated hosting accompanies numerous additional benefits for you and your website. More Storage Space: Most dedicated hosting plans include a lot more storage space for your website’s files. Improved speed and performance: Since your site doesn’t share server resources with anyone else, your site will often be significantly faster. Complete Freedom and Control: You can configure your server to match your specific requirements and get full access to every aspect of your site. Increased Security: Since only you have access to your server, it won’t be vulnerable if another website gets attacked. You will also have a unique IP, which makes it much less likely that your site will be blacklisted. A wide range of hosting services have their own pros and cons. Which one you should pick depends completely on your website's requirements and the level of control you want. Let's discuss whether dedicated hosting is the correct decision for you. The main factor to consider while considering a dedicated hosting plan is your website's size. This option is primarily beneficial for larger websites, like, eCommerce businesses and high-traffic websites. That is on the account because these websites should be reliably quick with a negligible amount of downtime. For a business website or online store, performance and reliability are extremely important. The fact that no one else can access your server also guarantees that your website is secure. Nobody will be able to access your stored data, and you will be better prepared to deal with threats and attacks. You will also benefit by the additional storage space. Normally, all of this includes some major disadvantages. Dedicated hosting is quite often more costly than VPS or shared hosting. Whether that extra cost is justified or not, depends upon your budget and needs. However, the increased performance, control, and versatility will be justified for larger websites that cannot afford to compromise. If you have chosen that dedicated hosting is maybe what you require, despite everything you have to look for a right hosting provider. jiWebHosting offers a complete package for dedicated hosting that is both powerful and reliable. jiWebHosting's dedicated hosting is perfect for any high-traffic website that requires guaranteed fast speeds and reliable uptime. Since we also offer managed hosting, you will never need to stress over your website's performance and security. We will secure your website against attacks, monitor its activities, and offer support round the clock. You will also have unlimited bandwidth and databases to play around with. 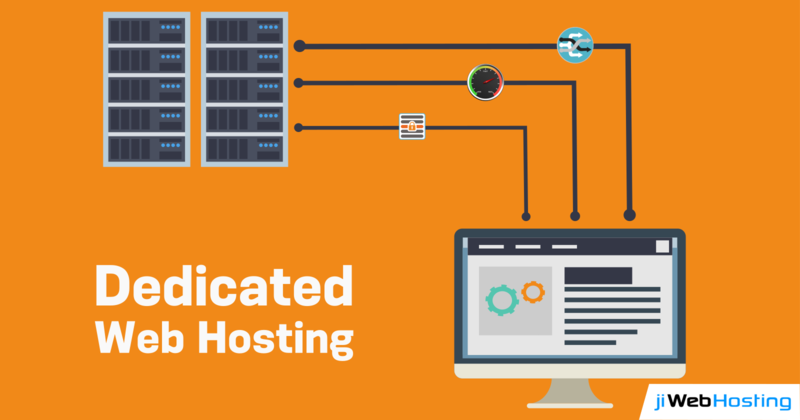 If your site gets a considerable measure of traffic or you simply need full control over your own server, dedicated hosting can be a brilliant decision. It offers the most control and best performance for your website, and it is easier to configure than you might expect. Get in touch with us to know the pricing plans and get it installed at the earliest.